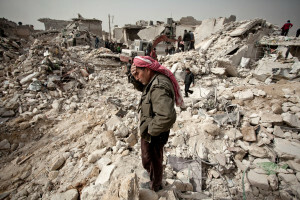 The Syrian crisis has been going on since March 2011 and has resulted in tens of thousands dead, including civilians, hundreds of thousands of refugees, enormous financial losses, and the destruction of historical and cultural sites and the country’s infrastructure. The increasing militarization of the conflict threatens to destroy Syrian statehood, cause genocide of religious and ethnic minorities, and destabilize and spread terrorism, both in the Middle East and in neighboring regions. The crisis in Syria has gone global, and many external factors are at work there to a greater or lesser degree. The anti-government armed groups, which have carried out a wide range of terrorist attacks, include the most extremist forces of radical Islam — al-Qaeda among them. Yet the leading countries of NATO have declared that they support the radical Syrian opposition, and that support includes supplying it with weapons. Unfortunately, the Arab League has taken the same position and essentially transformed itself into an instrument of the Persian Gulf monarchies’ anti-Syria policies. The NATO countries have assigned Turkey a significant role in their plans for regime change in Syria. Smuggled weapons for the radical Syrian opposition bought with Saudi Arabian and Qatari money pass through Turkey. It is clearly no coincidence that the armed Syrian opposition’s command center is located in the Turkish town of Adana (100 kilometers from the Syrian-Turkish border) near the military base in Incirlik that houses US military and intelligence personnel. The most active antigovernment group, Jabhat al-Nusrah, confirmed in April 2013 that it is affiliated with al-Qaeda. Its leaders also said that once they overthrow the Bashar al-Assad regime, their top goal will be to attack Israel. According to the Western and Arab media, statements like that have evidently led the United States to train their “own” fighters in Jordan for operations in Syria against both its leaders and, possibly, against the radical Islamists should they attack Israel. The situation is resulting in the formation of a hotbed of extremism and terrorism in Syria and causing its spread both within the region and beyond it. It has caused sectarian clashes between the supporters and opponents of President Assad, exacerbated the domestic political situation in Lebanon, increased terrorist activities by radical Sunni Islamists in Iraq, and energized extremism in Turkey. The desire of leading NATO countries to utilize radical Islamism to overthrow undesirable regimes is particularly noteworthy. On the one hand, the West is fighting radical Islam in Afghanistan, Yemen and Mali. It was supporting Islamist forces in Libya against Gadhafi, and it is currently supporting those same Islamists in order to overthrow President Assad. This strategy can only mean that the West expects that it will be able to manipulate the “jihad” of radical Sunni Islamism after regime change in Syria for use against Shiite Iran, which is gaining influence in Iraq, and against Hezbollah in Lebanon. The next objective of this strategy will surely be the CIS Central Asian republics and, finally, the North Caucasus, southern Russia and the Muslim regions of the Volga River basin and the Urals. Moreover, the conditions for such a development in these regions are already coming together: Terrorist activities by radical Islamists are being energized there. A large number of people from these areas are fighting alongside the armed Syrian opposition. However, that is largely a deluded strategy. Radical Islam is anti-West by its nature and ideology. All of its ideologues, from Sayyda Qutb to al-Zawahiri, have said as much. It may form a tactical alliance with the West to achieve its own goals, but afterwards it is bound to oppose the West. History and recent international developments both confirm that. In an effort to weaken the Soviet Union during the Afghan civil war of the 1980s, the United States supported the “jihad” of bin Laden and al-Qaeda, which he headed, against the pro-Soviet Afghan government. After achieving its goal, however, bin Laden turned his “jihad” against the United States, calling it “enemy No. 1,” which resulted in the terrorist attacks of September 11, 2001. In September 2012, American diplomats, including the US ambassador, were killed in Libya by Islamist fighters from the Brigades of Allah, which had taken part in the overthrow of Gadhafi, i.e., they were killed by those the United States had helped bring to power in Libya. France has also faced harmful fallout from its involvement in the military overthrow of Libya’s government, which led to the uncontrolled spread of weapons in the region and let them fall into the hands of radical extremists who have harmed French citizens. In 2012, for example, a radical Islamist of Algerian origin who held French citizenship shot three French soldiers, two students and a teacher at a Jewish school. In early 2013, Islamist fighters executed a French citizen they accused of espionage. In 2013 Islamist militants in Algeria seized 100 foreign experts, including French citizens, some of whom were killed. French troops in Mali are still fighting Islamist terrorists in 2013 who are threatening to seize the country’s capital. However, it is obvious that the crisis in Mali and the arrival there of Tuareg rebels and Islamists is a direct consequence of the collapse of the Gadhafi regime, which had successfully kept radical Islamism in check and had fought it relentlessly. Thus, France has had to deal with the mess left by the government of former President Nicolas Sarkozy, who was one of the chief movers and shakers in Gadhafi’s overthrow. That makes us wonder about the accusation leveled by Gadhafi’s son Seif al-Islam in a live television broadcast just before the NATO intervention in 2011. He said Sarkozy had received 15 million euros from the Libyan leadership for his 2007 election campaign. I would like to believe that the investigation launched by the French Prosecutor’s Office in April 2013 will be objective and transparent. Despite all these lessons, however, France’s current leaders are actively involved in the NATO operation to overthrow Assad and are directly supporting the Syrian opposition, which French intelligence is training. Paris is even in the process of deciding to supply the opposition with arms even though radical Islamists are known to form the opposition’s core. It turns out that in Syria France is supporting the same forces it is fighting in Mali. Finally, I should mention the recent tragic events of April 2013 in the United States: the terrorist attack at the international Boston Marathon in which people were killed and more than 170 were wounded, and the poison-containing letters that were sent to a member of Congress and to President Barack Obama. The terrorism that has now reached America has its origin in those regions where the West and particularly the United States are trying to utilize it to achieve their own foreign policy goals. Fighting extremism and terrorism and preventing its spread is the shared task of the international community, especially those countries most capable of doing so. Their attempt to play a “game” with extremist forces and use them for their own purposes is a dangerous mistake, and it may rebound against the players themselves. That is particularly true of the Syrian crisis, which can only be resolved by political means. Much depends on all sides having a clear understanding that it is dangerous and unacceptable to divide terrorists into “the good ones — ours” and “the bad ones — theirs,” and that all forms of terrorism must be fought jointly. Boris Dolgov, Cand. Sc. (History), is a Senior Research Fellow at the Center for Arabic and Islamic Studies of the Institute of Oriental Studies of the Russian Academy of Sciences. This article was written expressly for New Eastern Outlook.